I can't believe I don't make these more often. I mean, just look at them! Perfectly golden and packed full of flavor all to be dipped in a delicious marinara or Tortellini Soup. Let's cut to the chase. I don't need to keep talking about how incredible they are. You just want the recipe. 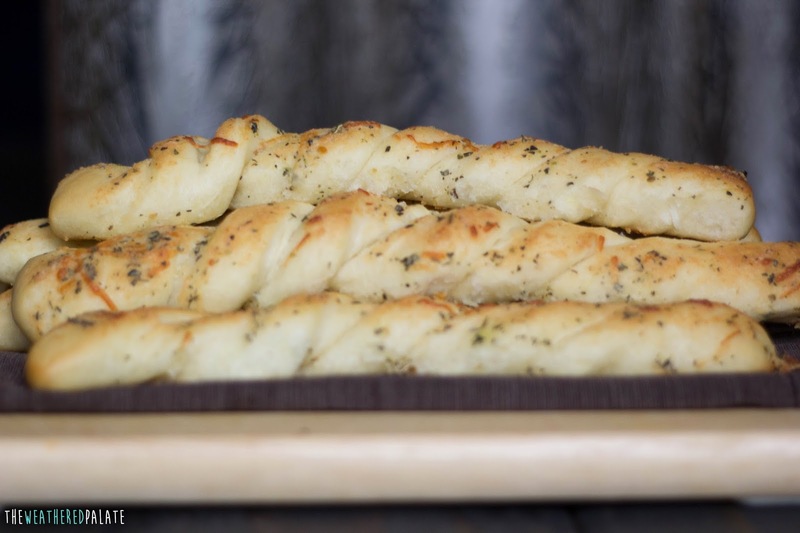 This recipe yields 10-12 foot long bread sticks. 1. In the bowl of a stand mixer, add water, yeast and sugar. Stir to dissolve yeast and sugar and let sit until yeast activates (you will see the yeast foam and rise to the top-about 5 minutes). If the water is too hot or cold, the yeast will not activate. 2. Pour in one cup of flour, milk, butter and salt. (Do not pour the hot butter and salt directly on top of yeast mixture. Pour in the order stated.) Mix for 1 minute. 3. Slowly add remaining flour, scrape down the sides of the mixer mix with dough hook for 2-3 minutes. 4. 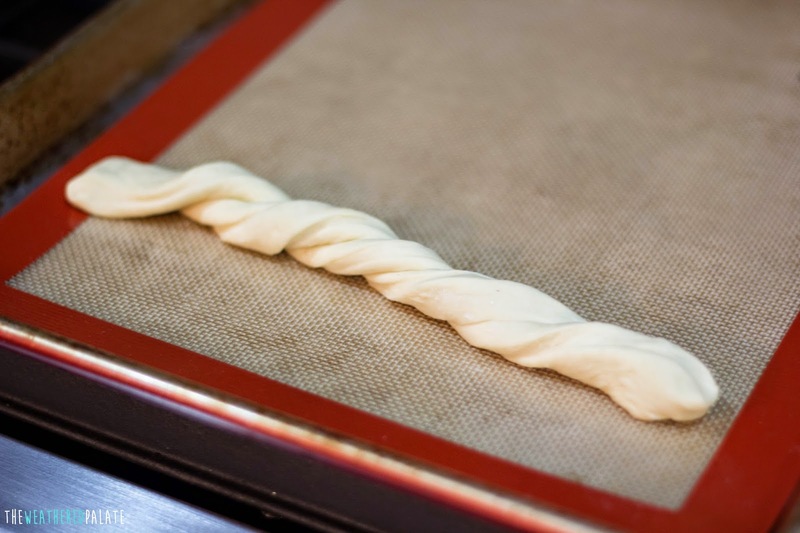 Dough should be soft and slightly sticky. 5. In a greased bowl, put the dough and cover with plastic wrap and allow to rise in a warm area for 1 hour. 6. 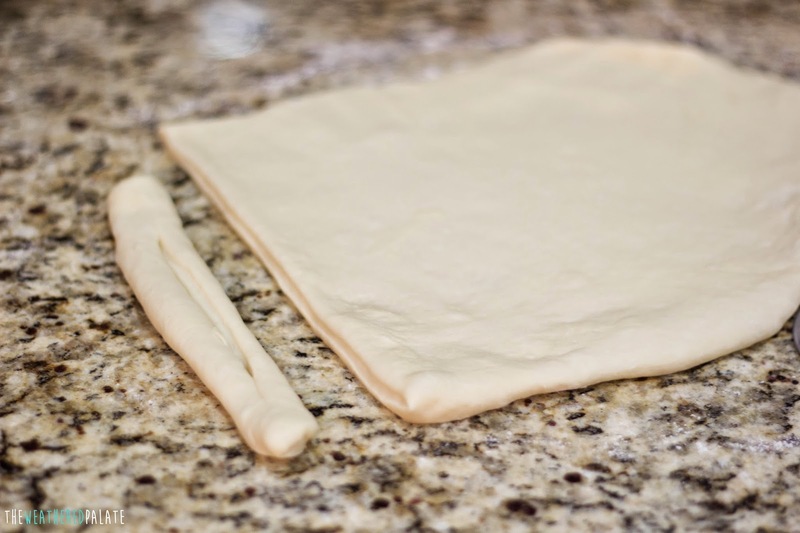 After the dough has doubled in size, roll out out into rectangle (about 1/2 inch thick) and cut into 1 inch strips using pizza cutter. 7. Take each strip and cut a slit down the middle one inch from the top and stopping one inch from the bottom (see pictures below). 8. 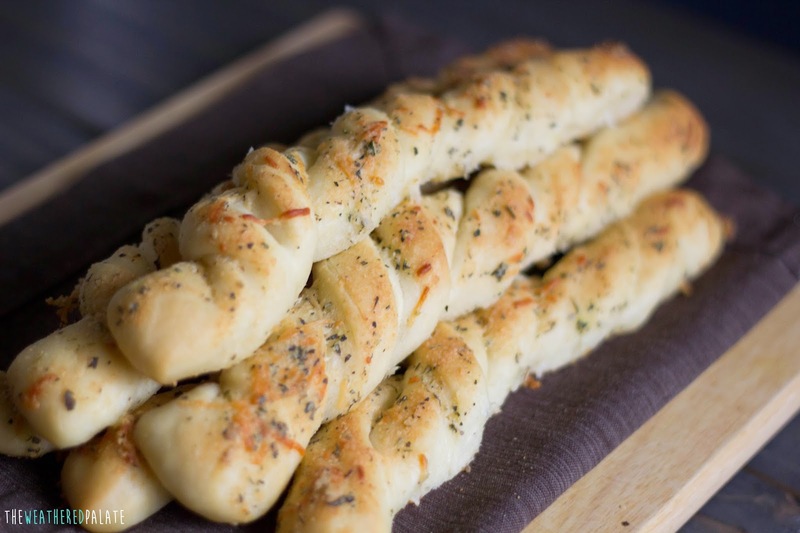 Twist each bread stick and place on a cooking sheet. Cover and let rise for 20 minutes. 9. 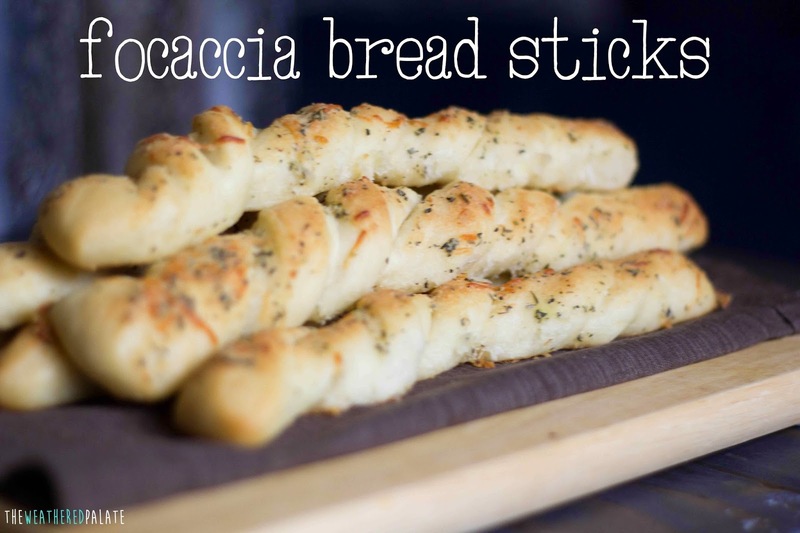 Mix topping ingredients together and spread on top of bread sticks. 10. Bake in a 400 degree over for 15 minutes. 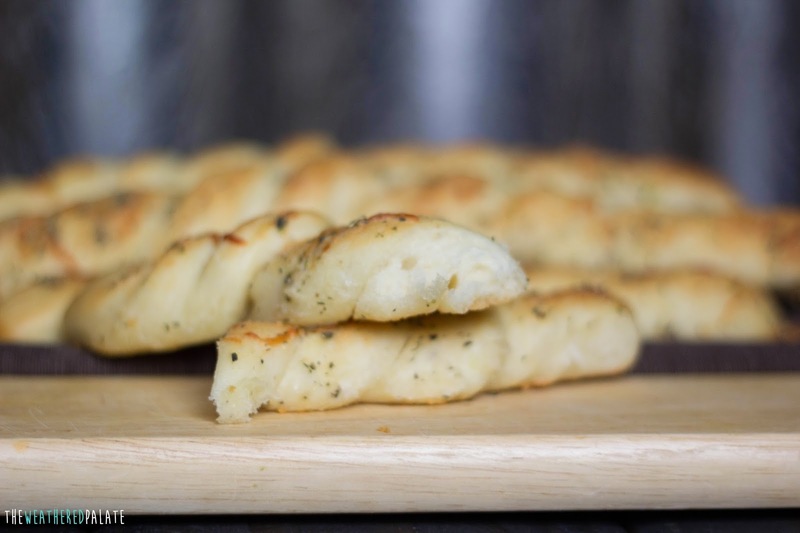 Variations: top with olive oil, garlic and cheddar cheese for garlic cheddar bread sticks. 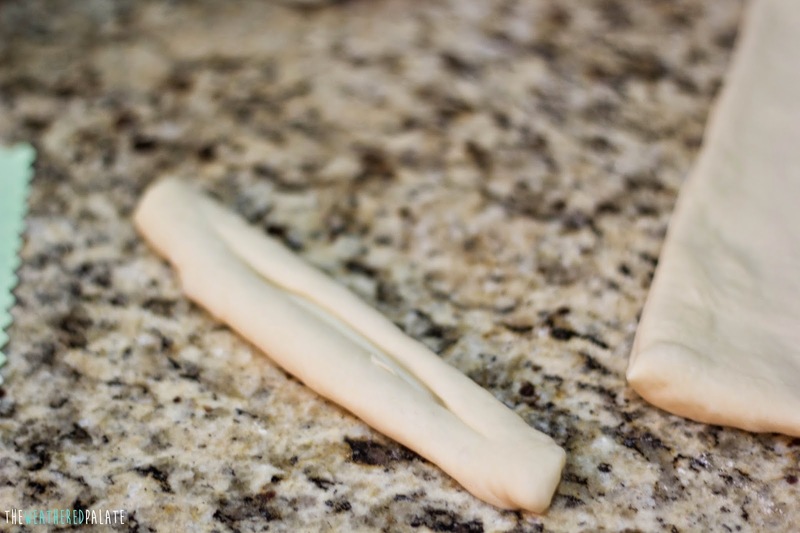 Slit each bread stick down the middle making it easier to twist. They are like little Italian pillows of heaven. I served these bread sticks with my Spicy Italian Tortellini Soup. A perfect combination for a cool fall evening!